Hi Friends: There is a new challenge today over at the Crafting When We Can Challenges Blog, where the current theme is Happy Birthday. Please visit our fabulous sponsor this week, Karleigh Sue, to see all of their wonderful products! 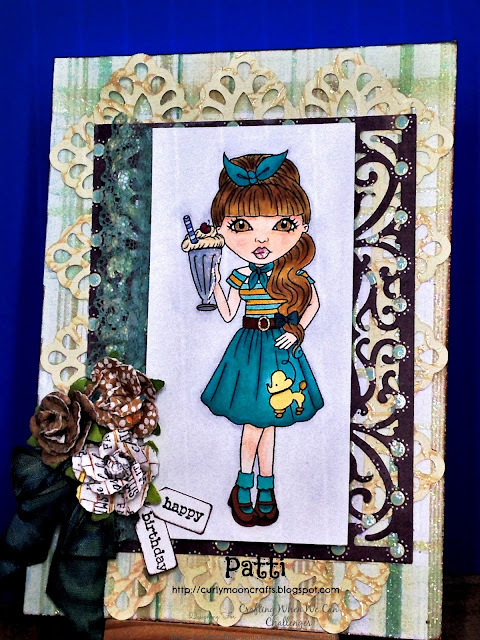 My creations for this week are 2 cards using these digital stamps: Its My Birthday and Poodle Skirt 2015. I hope that you are inspired by my creations and will join us over at the CWWC blog to see the creations of the other design team members and enter for your chance to win a great prize from our sponsor. Process: For both cards, I started by printing the images onto smooth white cardstock. Card 1: I colored the image with Copic Markers (listed below). Once complete, I added a bit of sparkle to her lips using my Stardust clear glitter pen, and some Glossy Accents to the ice cream glass. 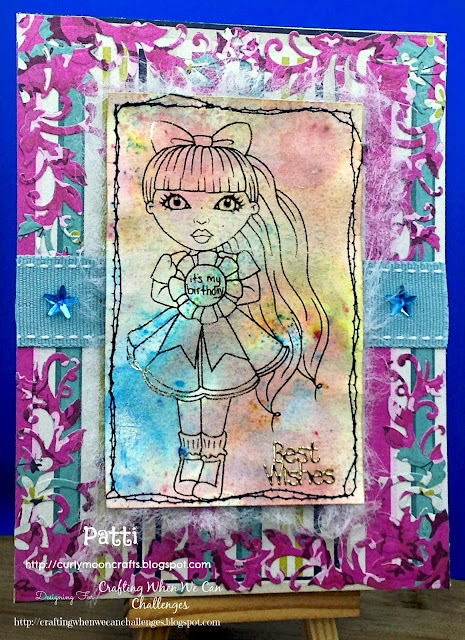 This card uses the MME I covered a base A7 card with the plaid paper, then cut the Moroccan border die from a beige glitter paper and layered the borders over the base layer. I cut the Flourish Pattern die from the brown and teal dot paper and layered it in the center. I popped my image up with fun foam and centered it on the card. I died some crinkle ribbon and lace with Stormy Sky and Broken China Distress Stains and added them to the card. I added some flowers in the corner, then stamped the words onto white cardstock with brown chalk ink,cut them with a mini tag punch, and added them under the flowers. Card 2: I wanted to use my LSG magicals again, so I foiled the image with rose gold foil, then sprayed water and tapped on the Mermaid Seashells and let them move across the page. As usual, the camera doesn't capture the shimmer very well - it's beautiful in person. This card uses the MME Cambridge Court paper pad in the background. I layered a card base with the striped paper, then cut the Flourish 2 die from the floral pattern paper & added them to the corners of the card. I added ribbon accented with stars, then layered the focal image to the center with fun foam. I added a bit of gauzy dryer sheet material to the back of the focal image. To finish, I added the Best Wishes sticker to the bottom.